Anyone looking at the side profile of the Great Pyramid would find it hard not to ponder the meaning of the many shafts and alignments inherent in its design.It really does appear to be a conundrum in stone….an almost unsolvable puzzle yet one that begs to be unravelled. This is certainly my feelings toward the structure. Any construction designed to be decoded or read would also in its design encourage an investigator to decode it. Anything poorly made and not following any guiding principles would soon fall by the wayside …The structure would have to be perfect, immovable, unable to be replicated, even today and resilient to the passage and ravages of time…both physically and politically…..GP fits all these requirements . So if the builders of GP have left a message in stone for us what might that message be?...Keeping in mind the incredible effort and skill in completing such a structure. Ok… But what is the biggest revelation that could be ‘uncloaked’ ….what revelation could be worthy of such incredible attention to detail? The interconnectedness of all things, language of creation being expressed through mathematics and a controlling creator /architect arranging this order of perfection. Words and meaning are tethered to interpretation, words alone are too unreliable and abstract, vulnerable to abuse…change and translation errors ...Chinese whispers syndrome comes to mind. With words, people with an agenda can add , take away text or rearrange / manipulate the wording…Often to fit an agenda they may have already decided upon before approaching the GP with what should be fresh eyes. I hope everyone who approaches GP looks with fresh eyes we need all the new ideas to come forth GP is in danger of becoming a victim of Dogma. Already there are many silly ideas that are touted as fact….even though many of these facts appear ridiculous. Hard to believe they ever became facts….Such as Khufu built the Great Pyramid !.. Supposedly so because someone with an agenda supposedly found Khufu’s name freshly painted in a remote part of the GP………problem was later they discovered it was misspelt …Yet this is still the basis of GP being associated with Khufu………A ridiculous argument….yet part of the Dogma train following GP….Look hard and deep and most of all…….. Look with fresh eyes . So this universal language what would it be……….? Only one language cannot be misinterpreted and is still pristine untainted from the moment of creation……………mathematics. If in the beginning there was no thing (NOTHING)….no matter, just a void then no mathematics existed as mathematics comes into being only once there is spatial relationship between objects allowing angle and distance to reveal itself…….Mathematics was born when the universe came into being, the big bang came forth and mathematics was born… the language of creation. Time also came into being as Time is the measure of movement of an object through space…..If there is grand design then these time signatures should also have an ‘architect signature’ as well…and they do. It would also follow that a sacred measure or value should be present as the method of decoding the mathematical language ,revealing the signature of the intelligence or architect behind the creation…and the forthcoming realisation that everything is connected through this intelligence…and as such purging dysfunctional egotistical behaviour born from the belief in separation.......behaviour such as war, greed and excessive self interest. Our solar system is as perfect as GP…mathematical precision, nothing random…grand design everywhere….a symphony of mathematics. Maybe the GP builders, to pass on their message, would therefore have encoded this secret?….But why should it be such an important message to pass on ? Because the revelation hits home through the measuring of GP………..There is an orchestrating intelligence behind creation and we are part of that creation, it’s not about striving for our own and selfish ends but the whole. How does this revelation affect my behaviour to others and the whole. If taking to its conclusion this revelation should make anyone sit up and think about how they are interacting with the whole and have responsibility for all their actions …. …what a revelation! So how does GP show us all this ?....I f I was designing the revelation I would want it to be easy to find…with clues to help in the decoding process. To start with GP has an angle of 51.51 ……….only this angle gives us the perfection to convey the message. Robin Heaths discovery was a big one creating the link between cosmic and earthly realms encoded in GP…It gave us the Earth / Moon proportions through the 51.51 angle………Well done Robin!….It really is one of the greatest revelations to be found in the GP dynamics. This was discovered through carrying out the two most obvious geometry based intrusion into the dynamics. Any curious ‘newby ‘ looking at the profile would be tempted to find the exact centre on the base line…then connect it to the apex ……….First clue…line goes through Queens chamber dead centre…next draw a circle from the base centre to encompass base line diameter. Good, but one notices straight away it cuts through the top section of the pyramid. Next step complete the 2nd circle from the same centre through the very top apex of the pyramid…..Voila!! …Earth /Moon ratio…cosmic correlation after the 3 most obvious steps hinted at in its design. That above is all Robins work, From there on in its TM . This EARTH / MOON relationship seems so important to convey that there are a further 3 ways to find it as I will show………by simply following what’s already there. Many researchers now feel the shafts within the GP are pointing to stars/star groups related to Egyptian mythology…..This I do not dispute and just shows/reinforces how compounded the message of GP really is….As above , So below. Before I get into going through my findings from the diagram above please respect these original insights and recognise their origins . 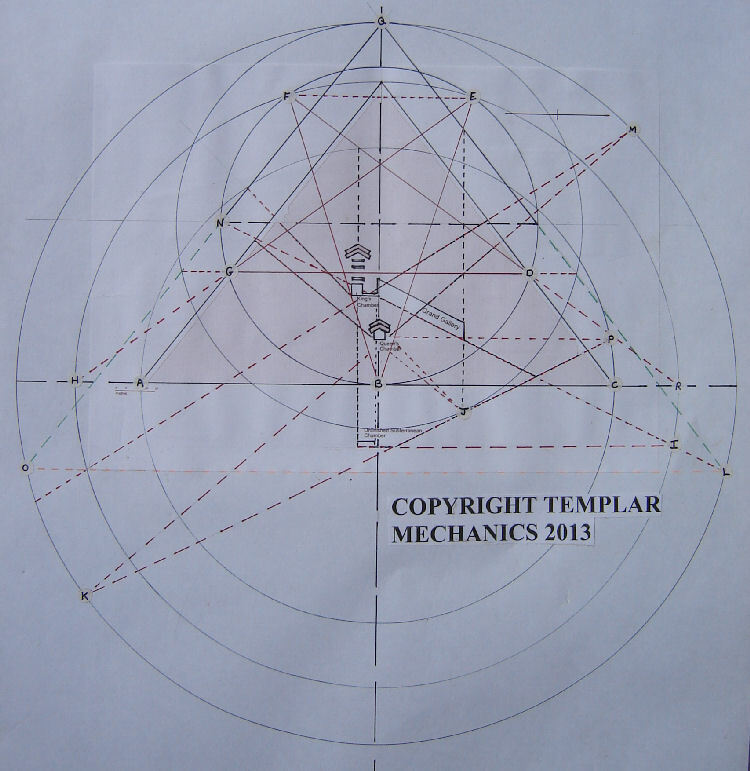 I have created Templar Mechanics as a free resource for the inquisitive mind ...not to be raped of content for others with a self serving agenda, usually monetary in origin. If you wish to use my work please e mail first. The new TM alignments / Revelations. Fresh eyes …tell no lies. 1. With the base centre holding the key to Robins revelation and the Queens chamber centre I went back to it to try some other inspired ideas…..I decided to take two 18 degrees angles , either side of main axis line( 36 total /penta) off this point(B) and go skyward….until the line hit Robins 2nd circle(E) that passed through the apex. I then took a 36 degree penta angle off that to see where it went and drew in the same length of that first 36 degree angle from the base centre……….It was then I noticed it ended at the very side of the GP, touching the very edge of where the casing stones would have laid (G)….noted by the black line..It was then I completed/ joined up all the points…a perfect pentangle with 36 degrees on all arms touching the outer 2nd circle and the very sides of the GP. 2. I then noticed connecting these two top penta legs went through exactly the very top of the GP without its cap….the missing cap line would then give you the two top penta leg points if you were approaching from another line of investigation …either way you would find the pentangle hidden within the GP…and with it the Earth/Moon circle. 3. The kings Chamber centre line made a perfect alignment to the end section of the subterranean chamber ….so drew this line in………then extended the sub. Chamber base line and noted the point where it met the now infamous 2nd circle (I)…..Extending the The Grand gallery line now completed a point of note and gave us again that 2nd circle. 4. 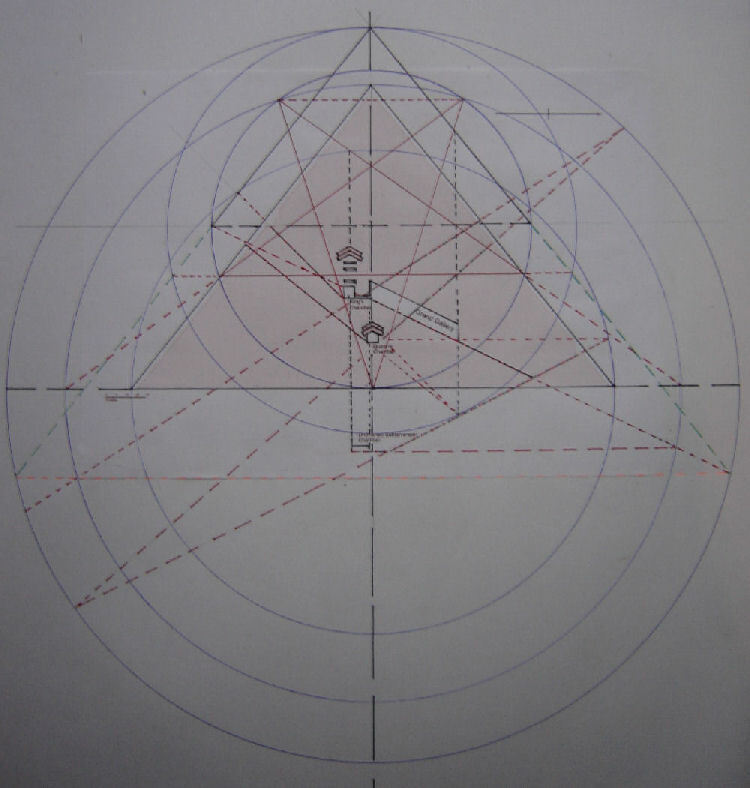 Extending the penta arms at (D ) and (G)…also meant the lines met where the 2nd circle passes through their pyramid base line……..so yet another way to find the 2 nd circle ( H) and (R). 5. Next I encased the upper inverted penta in its own circle touching points B,D,E,F,G this then led to other revelations…this line was exactly on /passing through the ‘scarred’ section of the pyramid with its missing stones…If continued it hit the penta circle circumference at (N)…which then made the grand gallery alignment through to( I) and (L). 6. The third circle came into being after noting that the Queen chamber shaft and King chamber shaft if extended converged at point ( M)….extending the same Queen chamber shaft /alignment the other way saw a convergence at (K) with the ascending passage line. 7. Points K L and M are equidistant from the original base centre at (B) meaning…a 3rd circle can be drawn in . This 3rd circle had no corresponding point of note at the very top yet I was sure there would be …Then I found it…You draw in the 2nd Earth /moon circle from the penta circumference circle noted by points B,D,E,F,G….This then gave you the 3rd circle point (Q) as well as alignment back down to point (L ) and (O). 8. One of the most fascinating points is ( J)…….extended Queen and King chamber shaft alignments converge here as well as marking an alignment through the very edge of the start of the Grand Gallery and up to where the penta line touches the 2nd 51.51 line that also gives us the 3rd circle….The ascending passage alignment gives us( P)(J) and K…which in turn gives the 3rd circle circumference position also. 9. Drawing in the Kings Chamber main axis gives us also the point where the new inverted penta crosses/meets the 1 st circle. I’m sure there is more to find in this ….and I am only offering a continuation on the study with new offerings …and that’s what GP needs,… a fresh approach…..based on the modus operandi of its design ….… alignments leading to complimentary spatial relationships …..the language of creation…mathematics. Please feel free to e mail tony@templarmechanics.com with any further insights, new or as a continuation on the alignments noted in this article.